Black Friday is the BIGGEST sales event of the entire year. 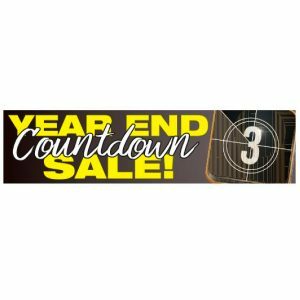 Your car dealership or retail store should start preparing now for the spike in customers and drop in prices on your inventory. 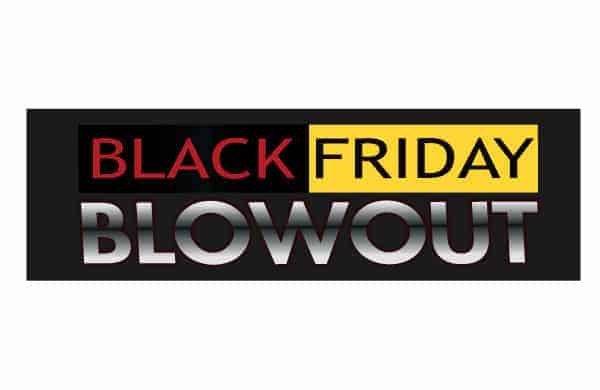 Our Black Friday themed promotional decorations are perfect for getting the job done and advertising all of your deals. 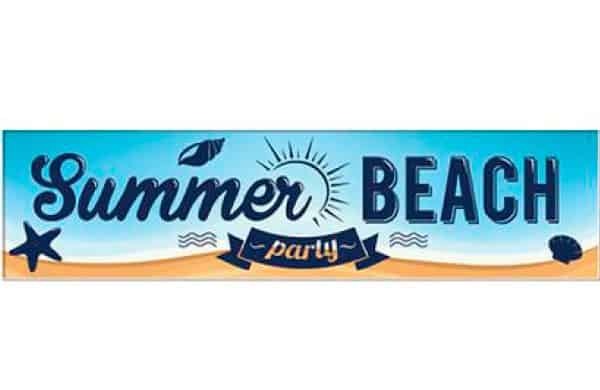 Our high-quality and bold graphics will make a high impact, guaranteed. 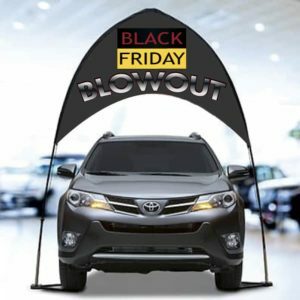 We even have Black Friday themed Giant Car Bows to place around your store or on top of your showroom vehicles. Nothing draws in attention and crowds like a giant car bow. 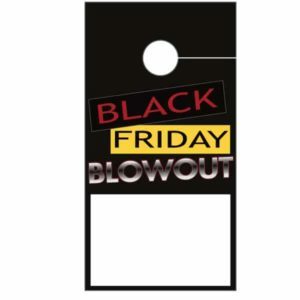 Another great option for your car dealership is our Black Friday Blowout Flag Hoodies! Add instant impact to your featured vehicles in seconds. The fitted stretch polyester fabric wraps around the hood of the vehicle with ease. Simply open the vehicle’s hood to apply; the elastic edge will secure the Hoodie and once the vehicle hood is closed it will stay in place! Our Flag Hoodies are great for test drives and crafted out of soft polyester material guaranteed not to scratch the paint of the vehicle. 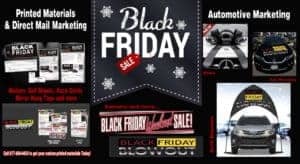 Don’t wait, order now and start preparing your dealership for the crowds that will be sure to flock to your store this Black Friday Weekend! Fits most Cars and Trucks! Large Size 5′ 3″ wide by 4′ tall. No Additional Charges if you provide Camera Ready artwork to size. Additional set up charge of $45; includes a single proof of the art. The Perfect Finishing Touch for any Special Occasion! 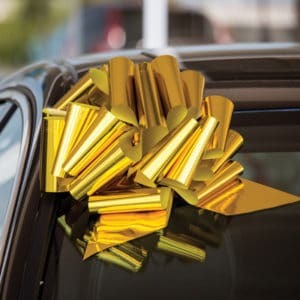 If you are on the lookout for the perfect decoration, ShakeUpYourShowroom.com has you covered with our decorative Giant Car Bows. 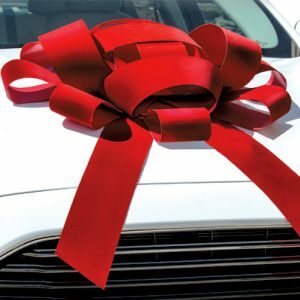 Our bows are used by companies year-round to promote product launches, decorate auto dealer showrooms, create visual merchandising displays and much more. 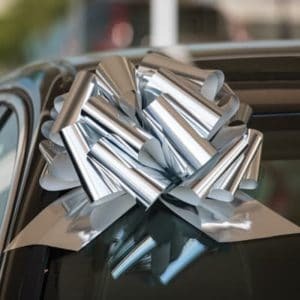 Additionally, our car bows will add a seamless finishing touch for big gifts that cannot be traditionally wrapped including trucks, boats, appliances, motorcycles, and anything else you can think of. 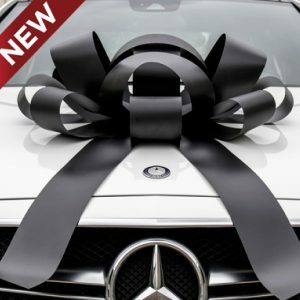 Popular events to showcase our bold Giant Car Bows include graduations, birthdays, weddings, anniversaries, and holidays. Whether they’re placed on cars in your dealership’s showroom or used to adorn your establishment for an event, our vibrant Giant Car Bows will make anything look special and stand out. These special accessories are available in an assortment of colors for any occasion. Our Giant Car Bows are hard to miss! We do custom orders so our Giant Car Bows can better suit your event. Our Car Bows are crafted from the finest quality materials available and feature a scratch-resistant ultra-soft magnetic base that is extremely easy to attach to any surface. 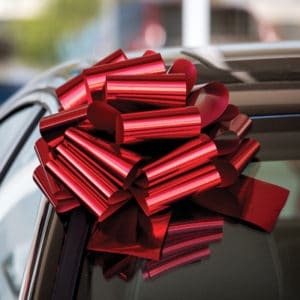 If you decide to place our Giant Car Bows on your vehicle, don’t worry about scratches or chipped paint because our bows are designed to NOT cause any marks wherever you place them. Choose from durable and weather resistant vinyl or a plush, luxurious velvet for your bows. Our car bows come in a jumbo and a smaller size depending on where you want to place them. 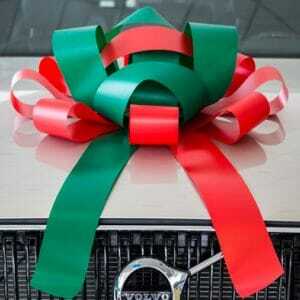 Make a statement and order your own set of Giant Car Bows online now! Drive Sales Forward While Making Your Business Look Incredible! Order our Labor Day Weekend Promotional Package to spice up your dealership and make a high-impact that will help you stand out from competitors. 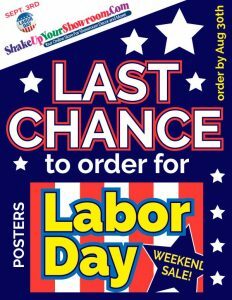 Our Labor Day Promotional Package includes one 3 x 12-foot vinyl banner, two 24 x 36-inch posters, and a set of 50 hang tags! 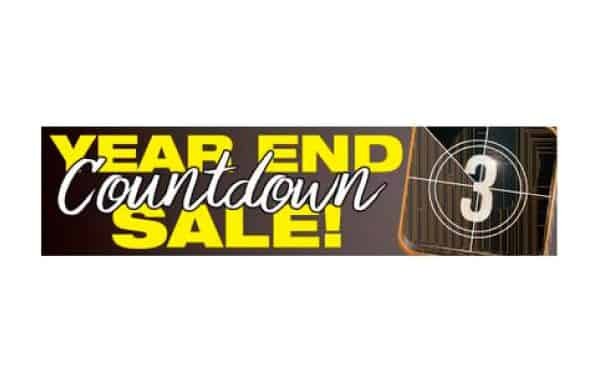 This gives you a variety of decorations display around your store and inside of your showroom vehicles. 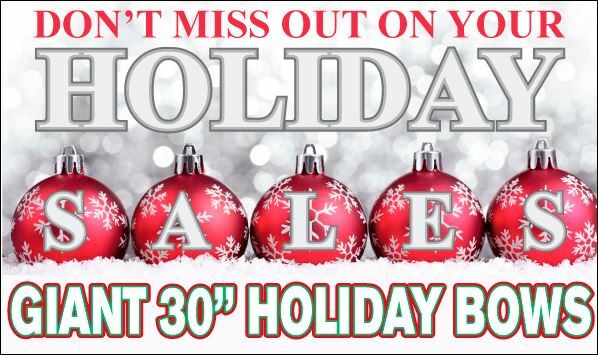 Hurry, because time is running out! Don’t miss out on this great opportunity to make your car dealer showroom look festive, polished, and put together for your Labor Day Weekend Sales! Our products can help your dealership keep customers coming into your store. Details matter! 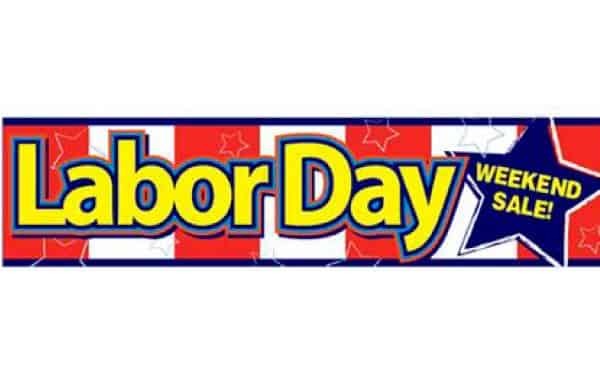 Order by 8/30 so your Labor Day Weekend decorations arrive just in time to decorate. Are you looking for a way to add something extra to your car dealership or retail store? Call us at (877) 424-4433 for special orders or questions.